I've been eyeballing the Empanada recipe in Nourishing Traditions for a while, but couldn't set aside the time (or energy) to make them. They aren't complicated...per say...? but because they have to be individually made an my family of six eats like a family of 10...well it wasn't a Rachel Ray 30 minute meal for sure. From start to finish I think it was about 2 hours with some additional bake time for the last few. But I would count it well worth the effort. There was some down time during the process and I did take the time to make these with my 9 year old daughter, attempting to teach her as many basic kitchen skills as possible. We've had 2 different versions of Empanadas in St. Augustine. And I must say if you are there you must try The Spanish Bakery. They've been in business for almost 40 years and run a killer lunch special of just over 5 bucks for an Empanada, a cookie, a roll, and a drink...all homemade. I know that is a ton of carbs, but it would be perfect for a day of walking through Old City and the Fort. After trying a couple different ones and talking with a Cuban friend of mine about what she put in her Empanadas, I came up with this. I doubled the recipe, and my enormously hungry family ate 19 of the 32. If that gives you any reference point. It may also take less time if you aren't doubling it. This recipe can be made and then frozen (before baked) on a cookie sheet and then transferred to a container to be baked for a quick meal later. 2 1/2 cups of unbleached flour (I haven't tried sprouted flour, but I assume a 1:1 ratio with unbleached would work okay)..Nourishing Traditions also has a recipe for Yogurt soaked pie crust that would be interesting to try. 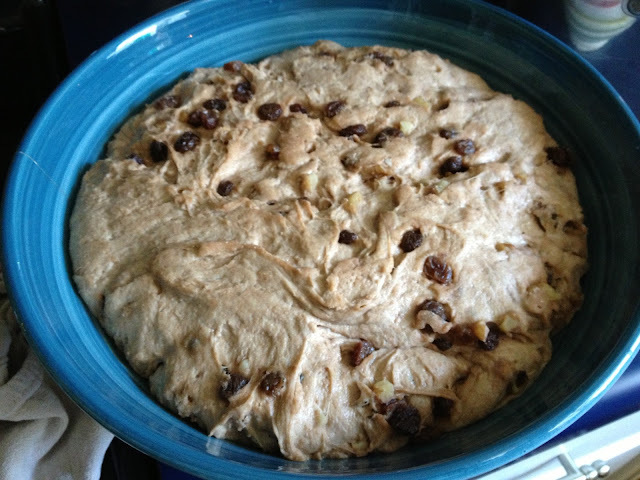 Be very careful not to add too much water at once or you will ruin your dough. Pie crust takes a little practice, but once you've got it, you've got it and you can whip up a crust without thinking! My rule of thumb with pie crust is a generous pinch of salt and sugar both. A larger pinch of salt if I'm making something savory, a larger pinch of sugar if I'm making something sweet. Brown ground beef. Add in carrots, onions, and peppers. Cook until they are soft. Drain some of the fat/liquid if it is in excess. I usually never do this, because I believe in the nutritional value of saturated fat, especially from animals raised on grass, but if your mixture is too greasy, it will leak out and ruin your crust. Add in the olives, raisins, spices and tomato paste. Turn off heat. Mix until incorporated. You may have to add a tsp of water to get the tomato paste mixed in. Your final product should be thick, but not runny and mixed well. Now for the fun part. Each Empanada will take about a handful (or golf ball) sized ball of dough. Roll out your dough in to hand-pie sized circles. I used the 6" circle on my Pie board and rolled each one out between layers of plastic wrap. Add 2 TBS of filling and fold over gently and then pinch the edges shut. Don't press around the filling. My daughter and I worked together on this part. Whether that saved time or not...there's no telling. But it did make for good quality time. If your dough gets too warm or sticky. Put it back in the fridge for a little while. If all of it is too sticky, just dust with flour as you go. 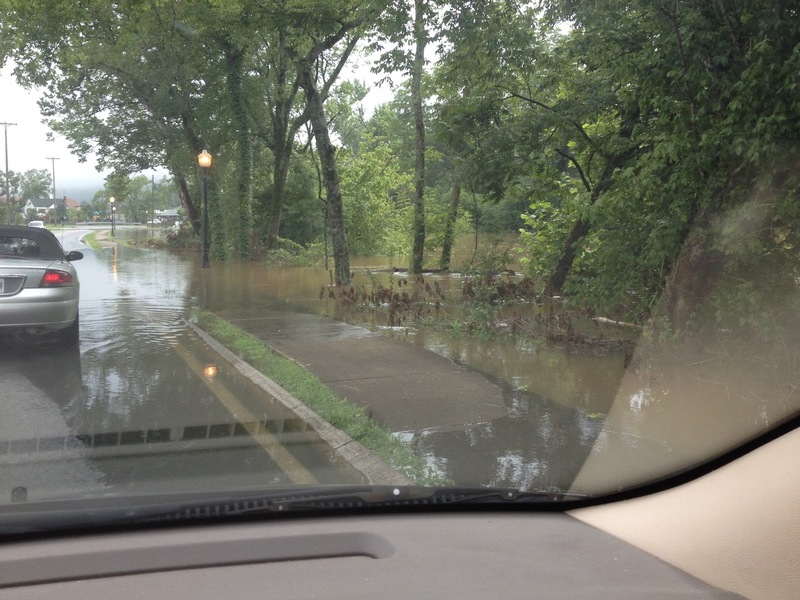 You probably added a bit too much water. I baked mine on a baking sheet lined with a silicone mat. But I don't think the mat is totally necessary, neither is greasing the pan. Bake in a 350 degree oven for 30 minutes. 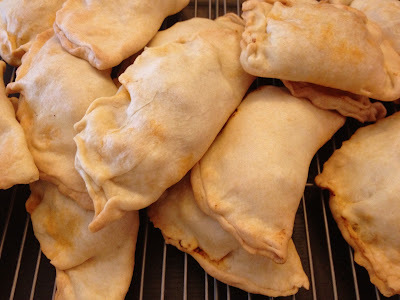 I used the Quick Bake (convection option) on 1/2 of my Empanadas, but couldn't really tell the difference. It still took 30 minutes to bake them. 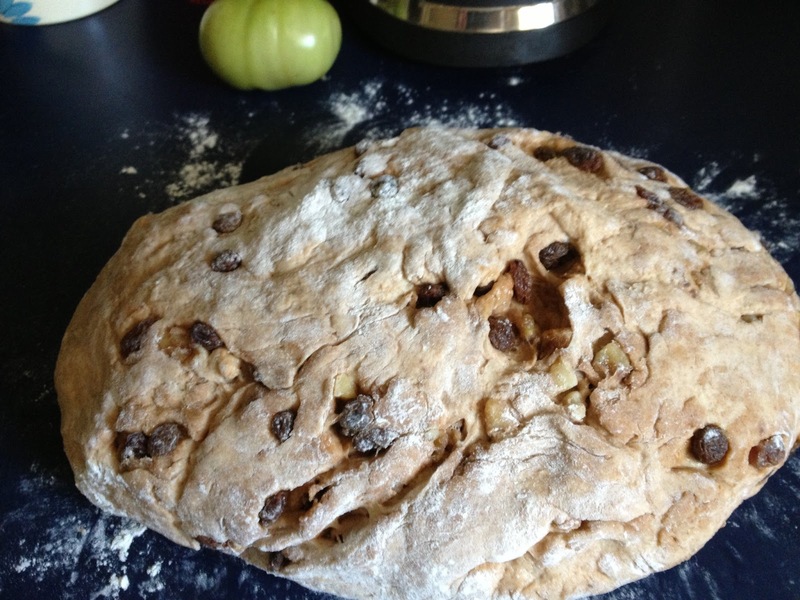 When a couple of brown dots appear on the surface of the crust they are done. Transfer to a wire rack and allow to cool until you can hold them without playing "hot potato". Enjoy! We had ours with Blue Corn chips and lacto-fermented salsa. I wish I had more time to prepare things like this, but that just isn't my reality right now. I must say when I do take the time to do something really special for my family, I never regret it. We spent the night watching a movie and talking about our trips to Old City. It was well worth it! A friend told me they didn't "nest" until the last few weeks. Part of me wishes that were so with myself, but the other realizes that if I don't get a head start on all of the unfinished projects around here, they will be put off for more than a year. I know with experience "a baby changes everything". I have been trying to tell myself, what's one more? or I'm a pro at this! But the reality is that in 13 short, quick weeks I will be waking up around the clock, become a human food bank, and well, all of the other responsibilities I have aren't going anywhere either. So I am on this mission to organize all of the things that make my life difficult. 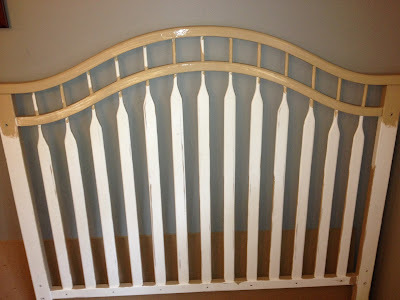 To baby proof a house that has gotten used to having children that know better. And to make space, for another life where it already seemed like there was a clear shortage. I make lists! Do you do this? I'm obsessive about it. I knew the full-fledged Nesting was here 2 weeks ago when I sat down to make 1 list of things that needed to be done so the kids could start the school year, and I finished with 4 pages. Some even include drawings of things that need to be built, with measurements of cuts and everything from cleaning, touching up paint, to what I need to sell in a yardsale to make space. Oh! Wait! Did I mention I want the freezer full of meals when the baby gets here? Deep Breath....Deep Breath...I know, I'm not in labor, but this may be the hardest part...I don't know I'll let you know after I push this child out on my bedroom floor without an epidural! Here's the beginnings of my "crossing off". It's kept me quite busy the last couple of weeks. Which has been good, because it has now rained every day for almost 2 full weeks (or more, I lost count). I'm painting this to be a headboard. 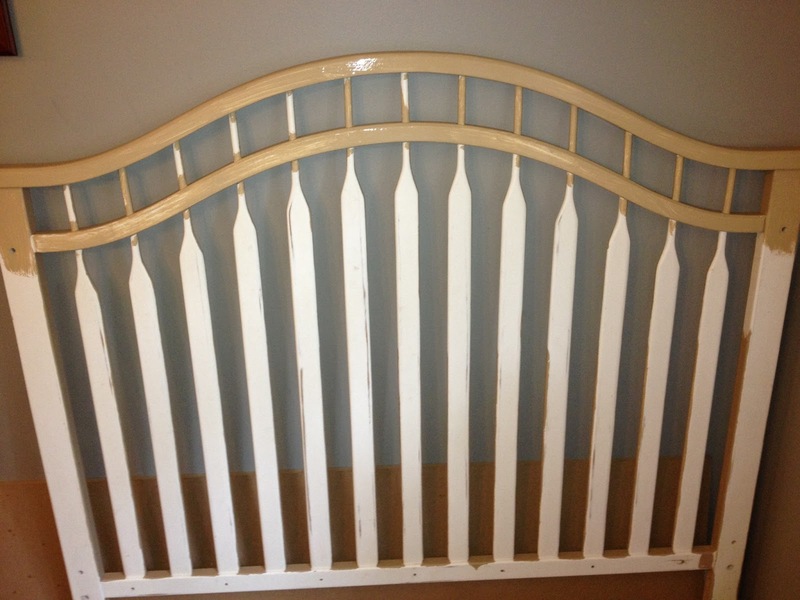 It is the back of a crib we used for our first 3 loves until it broke. I can't emotionally part with it, so I figured I would put it to use. 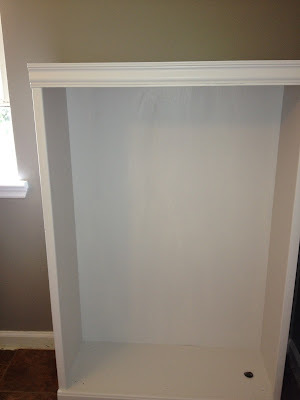 Here is the bookshelf I use for most of our homeschool stuff. On both of these I am using a technique called "chalk" paint or "milk" paint. If it goes well I will tell you all about it. 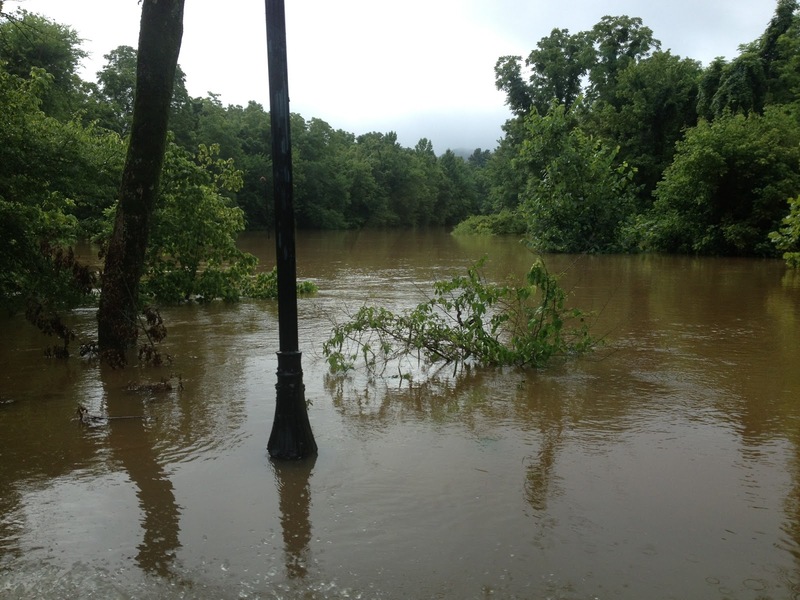 Speaking of rain, here are a couple of pictures of the river near our house...well it is actually just a creek I think. I've also been stockpiling soap, now that I have conquered my fear of lye and learned how to make cold-process soap. This tallow will become laundry soap bars this weekend! I rendered it in my crockpot. It seriously is a no brainer! And I thought my homemade laundry detergent couldn't get any cheaper! I've also been trying out/reading a lot of casserole style recipes. My goal is the have the freezer filled with meals. I did this the best when my 3rd was born. I didn't cook for almost a whole month. And without the mess of cutting boards and pots and pans, my life will be a ton easier! I'm opting for filling and comforting dishes--like stick to your ribs kind of food. These are the foods I like to eat most right after I have a baby. I think they pack the nutrition you need to go on no sleep and nurse 24 hours a day. They also reheat well, so everyone can just go easy through the new transition. We tried out this "New York" style baked ziti. It reminded me of the dad and son pizza business I grew up around in Florida. They were mostly run by displaced New Yorkers. A few of these are definitely going in the freezer. I will also be putting as many quiches as I can get into the freezer in there! 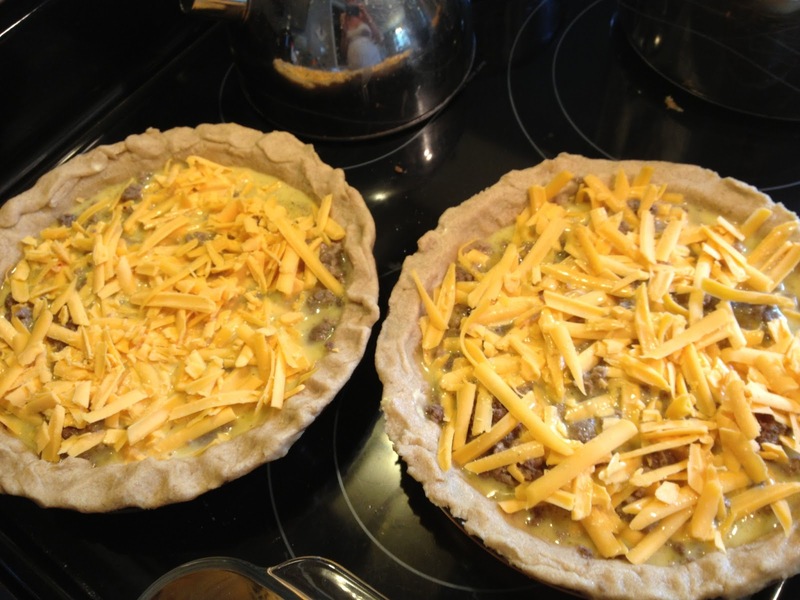 This is my family favorite Cheeseburger Quiche about to go in the oven. I've manipulated this recipe from a dish one of my friends brought me years ago right after adding our 3rd love to the family. It is so hearty and simple. I can't wait to share the recipe with you. Well, all is well around here. We are taking each day as it comes, trying to keep this pregnancy and family transition as peaceful as possible. I may not finish everything on the list, well, I will probably make a hundred more lists too and not finish those. But what will get done will get done, what won't...won't. For now I must go rest a little, I can feel all of this painting and cleaning I've been doing today in my back. On the subject of Rachel Ray, I do so appreciate the time she takes to explain technique. When I started cooking I didn't know the difference between chop or dice and let's just face it julienne wasn't even in my vocabulary. But by watching her show I learned to distinguish frying, pan-frying, and sauteing. Or what it meant to roast something as opposed to bake it. One of the things Rachel Ray is always using is Montreal Seasoning. It is generically marketed for Steak, but the flavor is great for any basic beef dish. Since I now steer completely of seasoning mixes, I thought this would be one I could whip up on my own and just in time for grilling season. Mix all of the ingredients together and pulse in a spice grinder. I use my coffee grinder and just wipe it out when I'm done. I'm excited to have a new all-purpose grilling seasoning. We just had it the other night on some grass-fed steaks with friends. Which seriously, eating steak with 8 children in one house and only 2 of them could use knives properly, but not well. That translates into adults, trying to have a conversation, but instead spending the entire evening cutting steak into bite-size pieces for tiny mouths...good times!! I'm finally back on the grid this week. Morning sickness has been gone for a while. Baseball season is over...which seriously, what is the deal with so many games in a little league baseball season? Anyone? Every other sport my kids play--one game, baseball 3-4/week. I also had a scare with an ultrasound and have now moved past worrying about that. And after all that we spent a week at the beach. So rested and tan, I am ready to enter back into the virtual world! Here are some things I read this week I thought were worth sharing. First, an amazing post from Ann Voskamp about working through our anger in parenting, even though we may have been raised to do differently. This one really felt like my heart was exhaling it as I read her words. If there is anything I need to learn to receive it is Grace. And if there is anything I need to learn to give it is Grace. This second article was written by Stephen Miller as a tribute to his 10-year anniversary. They got married at 18 and 20, and he speaks to the reasons not to follow the cultural movement of marrying older and starting a family earlier. I have heard a lot of "wow you don't look old enough to have 5 kids" or "5? really, were you planning that?" or worst all, "are you excited about this one?" Seriously, people am I excited that the God on high placed within me life and gave me the privilege of growing and nurturing it with my own body? Am I excited that the Lord would see me a fit enough servant to raise 5 people into the gift of his mercy and grace? So, yes I get it, not everyone likes kids or wants a bunch of them, but why ask questions like this. I don't go around asking opinion-charged questions to people who have chosen to live their life differently than I. I cannot fathom why people would feel the need to ask me the questions they do. )...sorry rant is over :) The article...it's good. It's good to hear someone speak with a similar heart on the subject. With summer breaking out in full force here...it was 95 with full humidity the other day!! My garden is coming in and so are the mosquitoes. I found these recipes for homemade organic fertilizer made from kitchen scraps and a diy organic mosquito repellent. I can't wait to try them! Speaking of my garden, I planted a tomatillo plant this summer for the first time. After I tried a recipe for "guacamole salsa" last summer that had me loading up on them, I figured I'd grow my own. I hope to perfect my own recipe by the end of the summer. I also want to perfect some Chocolate Kefir Cream. I've done vanilla every summer, but chocolate may take a little more work. I found this recipe, but I must be honest it has me a little nervous about adding the eggs to the warm milk. Have you ever had "ice cream" with scrambled eggs in it. I have once and it was quite an experience! I remember how good the ice cream was and you wanted to eat it so bad, and then you would bite into a rubbery egg piece. So because of that, I've always stuck with no egg recipes. So this summer, will be the summer I move past that fear! Is there anything you are afraid of in the kitchen? What would it take you to get past it? For me it is always a little success...which doesn't always come easy! Well I know it isn't official until next week, but in my book, once there's watermelon and watersides, it's here! Happy Summer everyone!! If you have been around the traditional food circles very long, you will soon find one of the things that makes us stand apart from the other Real Food peeps out there. Sacred Meats. Yep. Organ Meats. Liver. Heart. Brains. Okay if you are gagging...please keep reading, you may learn something. These are the parts of the animal that most people throw away or use as fishing bait. 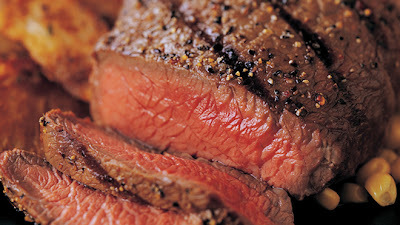 But these are also the meats that traditional cultures knew to be the best for strength and healing. I must first say liver is gross. I'm not going to sit here and tell you that I have found some magical way to cook it that makes it taste like Filet Mignon. I will say that I have found a couple of ways to cook it to get it down the hatch so that my family can reap the benefits of this life-giving meat. As far as heart and brains...well, we will leave those for another day. I haven't gotten brave enough to eat brains yet, but we did have the heart of our cow ground into our meat, so we are eating a little of it each time we eat tacos or bologonese sauce. Haven't noticed any difference. Would love to discuss that later on a post on why you should consider purchasing a side (or half) of beef from a local farmer. On to liver. It's bloody. It's mushy. It has a strong flavor. If you cook it too long it taste like rubber. And all of the recipes with it feature it with onions which are hard enough to get kids to eat in the first place. So why even try to get the stuff down? So if our grandparents ate liver on a regular basis, why don't we? Modern science, in an attempt to explain heart attacks and clogged arteries has placed the blame on dietary cholesterol. This subject is more then I want to get into here, but I will address it simply. Cholesterol is our body's protection against inflammation. Inflammation is caused by foreign substances, most likely high-sugar diets, high-stress lifestyles, and the onslaught of poisonous substances in our environment and food (i.e. pesticides, fertilizers and pollution). Dietary cholesterol does not raise blood cholesterol. Period. 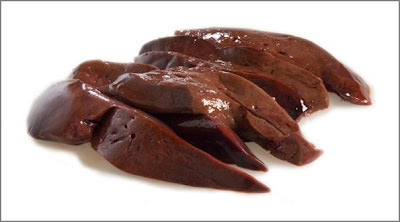 Another concern about eating liver is toxins. Because the liver filters toxins from the body, then one would assume the liver of an animal would be full of toxins. For this reason, I recommend knowing the farm where your liver comes from. The lower the toxic load on your cow, the cleaner the liver. Cows raised in rural places on untreated grass will be the healthiest. Your local organic grocery store should be able to provide you with this information, or the farm the liver is from so you can contact them yourself. Better yet, take a drive, meet the farmer, see the cows. Then you really can rest assured you are giving your family the best! During the cooler months I roast 2 chickens almost every week to take some of the pressure off life when it comes to fixing meals. Now that the deep south is heating up, I am trying to use my oven a little less and send my husband out the back door to the grill. I just found my rotisserie attachment and I can't wait to use it on my whole chickens, but this week he grilled up some boneless skinless breasts for us to use in meals. I must say boneless skinless meat is not my favorite for flavor at all and it tends to get dry easy. I do however recognize how convenient it is and I can tell from cruising Pinterest that it is the most popular form of chicken people use. My husband is AH-mazing on the grill, but even his perfect chicken breast, I won't just sit down and eat. But they do make a perfect addition to grain-based salads or tossed salads, where I can soak them with lots good fats like my Homemade Probiotic Ranch Dressing or this simple Vinaigrette I want to share today. This is a salad a friend of mine created a few years back, and after she shared it at a picnic it became a mainstay in the spring and summer months in our house. You can use green beans or asparagus, which ever is in season. You can even use the frozen and it will still be good. It was originally made with all quinoa, but when forced to improvise (like at 4:45 when I realized I had only 1 cup of quinoa and the nearest store that sells it is 20 minutes away), I tried making it with brown rice. I have to say I think it is a little better. 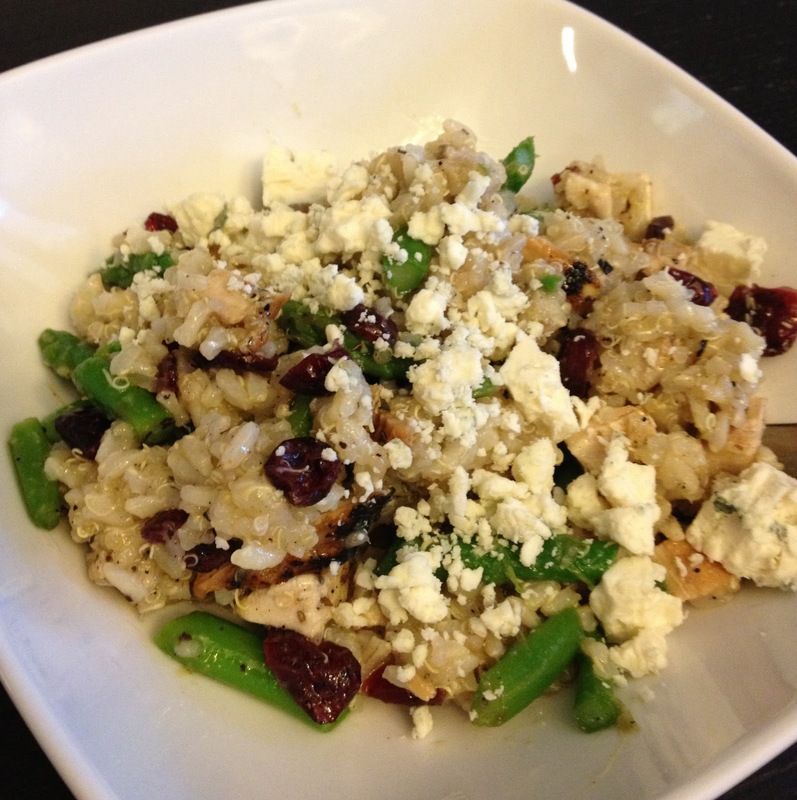 The chewy texture of the brown rice melds well with the creaminess of the quinoa. It also doesn't hurt that brown rice is quite a bit cheaper! This recipe makes a lot of salad. You could easily half it or keep the extra in the fridge for quick lunches. Because it's mayonnaise free and is good cold or at room temp, it would be great for all of those summer picnics too! Whisk together ingredients and pour over salad. Mix well and serve. This will save well for extras for a few days. If you leave out the chicken it makes a great side dish. And just in case you are like I was when I first started cooking, here are directions for how I make fool-proof brown rice. To cook rice combine all ingredients in a medium sauce pan over high heat. Bring to a boil. Turn to low and cover for 30 minutes to an hour. Try not to stir, this is easier said than done. When liquid is absorbed, remove from heat and let set 10 minutes before fluffing and serving. For the salad, add rice to a bowl and put in the freezer until it cools. I know you are thinking, seriously lady? I know how to cook rice, but I do have to say this was not a skill I had. I was perplexed by the burned pot of sticky goo years ago and would only use those nice little "minute" bags. I was finally very thankful when someone broke down the process for me. We all have to start somewhere! And trust me my "somewhere" was a very sad place. Well, keep enjoying the summer, I know I will a little more when my tomatoes come in. I am finally not sick!!! I know that is much more exciting to me than you, right? I gave up trying to keep up with with being a mommy-blogger and just decided to tread water being a mommy till my first trimester ended. Praise the Lord! I am still alive, and am crawling out from under the rock, just to find dust bunnies and fingerprints on everything. So here we go with spring cleaning/nesting and I have a ton of energy, because I just basically spent the last 2 months lying in bed trying to keep my lunch down. Before I fell off the cliff, in a virtual sense, I was mostly blogging on our journey on the GAPS diet. First I must say, I do believe we had a lot of success. We began transitioning into low-starch gluten-free grains (i.e. quinoa and millet) a few weeks back. We also started eating some potatoes. Nothing seemed to trigger any stomach pain, or other disturbance, so we went with it. I've read mixed opinions on how long one must be on GAPS, but we seemed to be cured of the minor ailments we had pretty quickly. We are still watching my husband's eczema closely, but it is mostly at bay. I must admit though I am not totally sure it was giving up grains that did it. The early stages of GAPS do a lot of detox to the body, and I am somewhat wondering if my husband didn't just need a good liver detox to rid his body of the build up of being on prescription drugs for so many years. As of now, high allergy season...and we live in the 3rd worst allergy city in America. He is fine, no anti-histamines, nothing! He's even using a netti to run off a cold our kiddos gave us! Also, we both have noticed that the anxiety/worry that used to plague him has subsided. Again, I'm still not sure what totally did this, but these are both ailments that people have claimed GAPS healed. I read some accounts where people claimed healing in as little as 6 weeks of minor ailments like seasonal allergies. My husband would have been on it 10 full weeks and then the following transition for the next 4-6, so maybe that was enough. It is quite impossible to tell if one's gut is sealed, and if over time we see a return of his symptoms we will surely give it another run for longer. But for now we are closing out this chapter of our lives. I must add, we are going very light on grains, especially wheat, rice and corn. These are some of the starchier grains, so we are keeping them to a minimum in our diet. 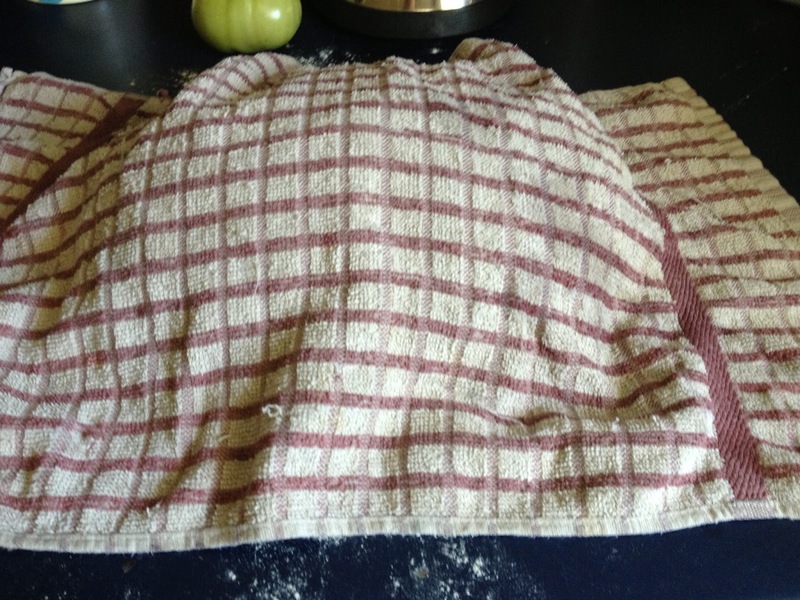 I have returned to soaking or sprouting our wheat for bread or other baked goods. I am wondering if because our diet wasn't so out of whack to begin with, that it took a shorter amount of time to heal our guts?? It really does work! I know it would be quite a feat, especially for someone with a child with disabilities or food addictions to modernized foods. But, isn't living with those things a trial in and of itself? I would support anyone I know in doing the GAPS diet, for cleansing, for healing, for hope. That's a wrap! 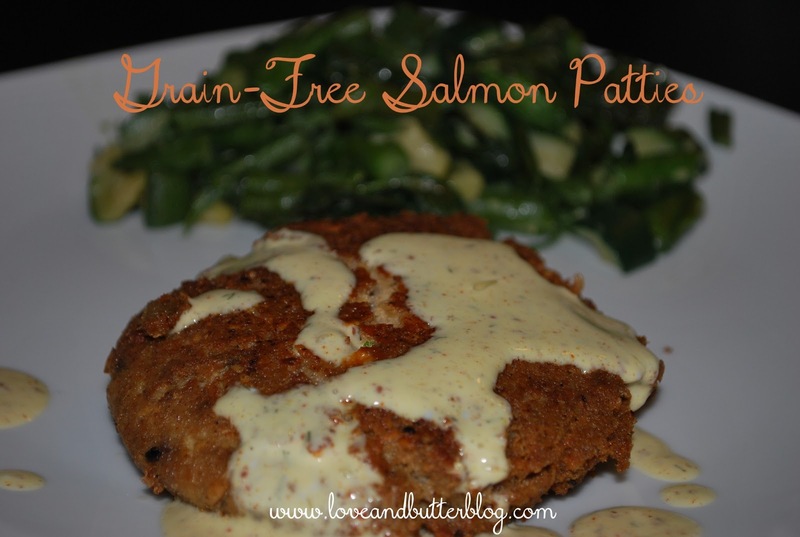 I will still post grain-free recipes from time to time, because I believe in varying the diet as much as possible. And I should be able to give gf options on some of my older recipes now that we've put it into practice for a while. All in all, I am thankful we took this journey. The views expressed in this article should not be considered professional medical advice, it is just opinion and personal experimentation. For help with the GAPS diet find a GAPS practitioner near you. I can't believe I haven't fallen off this GAPS wagon yet! I'm still super queasy all of the time, and on top of that, the GAPS diet has highlighted some of the digestion problems I have had all my life. Ones I had been managing with balanced fiber intake. But, GAPS is a healing diet and I know this is just part of the process to rebuilding my gut flora, so I am thankful I have taken this grain-free journey...well mostly. This week when I was grocery shopping, I saw this lady with a bunch of ramen noodles in her buggy. You know, the value pack that you used to keep in your dorm room? Okay, I must say, that in another life, one I lived mostly eating healthy food. I still ate my fare share of ramen noodles. Also, this was one of my favorite morning sickness foods. So there I am pushing my buggy filled with nuts and salad and juicing fruits and veggies...and there she is with her ramen noodles. It took everything in me to pass that last aisle and not get some. Then I spent the next 3 days...YES! THREE DAYS!!! Thinking about ramen noodles. I know this is crazy, but if you've ever been pregnant, you've been there, right? I didn't give in. I've been strong, so far. I may have to come up with a healthy alternative, I know it won't be GAPS legal, but maybe just once? So aside from day-dreaming of msg-laden, hydrogenated, college garbage food, I have found a couple of things that are easing my morning sickness. 1. Lying down. This seems to be the best, but it wastes a lot of time and isn't practical. 2. Drinking very lemony water. 3. Chewing raw ginger. This is super nasty, and burns going down, but it works in about 5-10 minutes. I take a thin slice about the size of a quarter and just chew it up and swallow. I rinse it down with water. 4. Sipping on pickle juice. I'm doing the fermented Bubbies right now. But I've almost been through a jar in the last 5 days, and at $6/a pop, that isn't something I can keep up. I have an AH-mazing recipe for fermented pickles, I just have to source some cukes and February isn't really the best time of year to do that...so more on that later. 5. Broth with a good amount of salt, but no other seasoning. (I was adding garlic and ginger before, but just plain right now.) This is, of course, a requirement on GAPS. I don't crave the broth, in fact looking at it in the fridge with the fat on top is kinda gagging me. And having it simmering all of the time, also not helping with the gag factor. But when my husband makes me some, (I know I'm spoiled) it always goes down well and makes my tummy calm down. So that is it for now. I may try some teas and other things. According to my calendar, I have 4 more weeks of this...and to that I say...geesh! The kids are giving me a ton of extra help and the extreme exhaustion seems to be passing...So I guess we are on our way to chubby knees and gurgling-toothless grins! 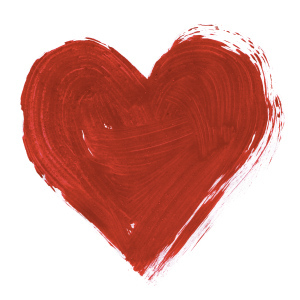 Thank you to my sweet readers for all of your messages of encouragement! It means so much! I wish I had something of more use to you to share today, but I have been at a loss for words or recipes or tips these days. You see I am 7 weeks pregnant, and for the most part I feel like a train has hit me. I am dealing with a ton of morning sickness and just plain exhaustion. It works that lying down makes my stomach stop turning, except I am sleeping away at least an hour a day when I could be writing for you fine people :)! So I am first honored to say that I get to be a mom again, to a little heaven-sent miracle. And no, I am not a dreamer, I do have kids already. I know what I have coming, but for now, I will focus on the beauty of this, (later on the diapers and teething). If you read my WAPF story, you know that the last two of my children were born under somewhat stressful circumstances for both my husband and I. So we are most looking forward to receiving this child into clarity and peace...well, as peaceful as 1300 square feet with 6 people can be! I am considering (with much prayer and research) having a home birth and will be excited to share our decision and journey with you. (I also have a really exciting guest post coming from LittleOwlCrunchyMomma on why she chose to have a home birth.) I am most interested in her story because she chose to do so on her first child, and I know I was a nervous wreck about my first. I think I was at the hospital before I even had contractions! On the topic of the GAPS diet, which I have been most recently writing on, my family is still plugging along. 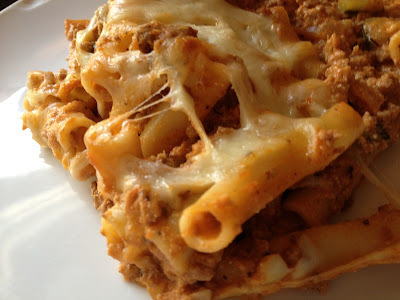 With the queasiness, my husband has been taking care of most of the meals and we have kept things really simple. Just meat and veggies, lots of broth and pro-biotic foods. My husband is really feeling great. His sugar cravings are gone, and those he sort of has he can usually take care of with a apple dipped in peanut butter. I must admit that I would love nothing more than to have a pack of saltines, but I am being strong...well trying to anyway. I am also looking forward to sharing a post a friend of mine wrote on how much the GAPS diet helped her son who was diagnosed with Aspbergers, Bi-Polar and a host of other things. She has been my biggest advocate on this journey. For now, blessings to you. I am very thankful for anyone who takes the time to read my words. I have been picking up some new readers and it never ceases to amaze me that you all are out there. I would love to say we made it all the way 100% on our second week of GAPS, but I have to admit we cheated this week. Just once...I promise. And it stood as a confirmation as to why we we are doing this in the first place. During our post-holiday cleanse, we had identified my husband's eczema was directly related to his wheat consumption. This was devastating to me, especially since I just figured out how to make the most amazing soaked bread. But I know, after reading GAPS and hearing an amazing lecture by a GAPS practitioner that if my husband has eczema showing on the outside, he has other stuff going on inside. On Friday, which is our usually pizza night I planned fully on making a Grain-free Crust. But then I let my grumpiness get to me (which will have to be explained in a later post), and I settled with my regular Sprouted Pizza Crust Recipe. My husband's eczema flared in 2.5 hours! I retreated like a cat with it's tail tucked in. I will stay GAPS as best I can, and will channel my grumpiness into searching for new Grain-free recipes. I need my family to be healed on the inside. The traditional diet has done so much for us, but I know along the way my husband wasn't 100% on board and his body needs this extra care. I also can't complain, the detox we did after Christmas removed my cravings for coffee in the morning. And removing sugar completely with GAPS has done wonders for my skin and mood balance...well once we got past the craving phase. This week my kids weren't requesting carbs like last week. So we are settling in nicely. My littlest monkey had a battle with some diarrea, but that has cleared up. I think he was just getting too much fat and not enough for it to "stick" to. My body is having a hard time adjusting to less fiber...hence my grumpiness, and Friday I could tell when I stepped on the scale and then tried to button my jeans. I am hoping I will be able to find the right balance with GAPS approved beans and lentils to keep my gut moving the way it should....well now that I've said all that, can I really move into what we ate? Oh! I should mention I am trying to empty out my freezer, so excuse the randomness this week. I found a bunch of packs of sausages I had bought on markdown at the bottom of the freezer...and some steaks. I am embarrassed we ate the same thing twice, but Tuesdays and Thursdays are really busy for us. You know you have weeks like that too! These are my hubby's specialty. He is Southern through and through. It's one of the things I love most about him. We love cooking together, but I must admit as our children get older and our schedule fills with activities it is less often we get to share this pleasure. 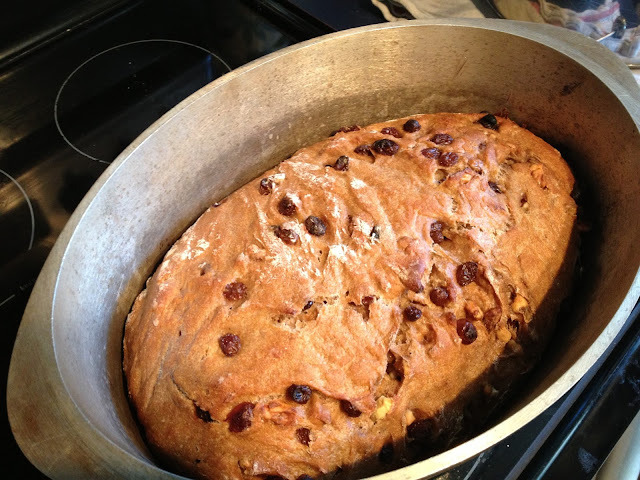 In the spirit of the South, here's a traditional recipe made to fit into our GAPS lifestyle. Hope you like it! We eat these every other week or so, it is a tasty way to get your fish servings in. These are super filling and they reheat well in the oven (or microwave), you can also freeze them for another night. For the cause of laziness, whenever I make the mess of frying, I try to make extra if it will freeze well or at least put it in the fridge for lunch the next day. Add all of the ingredients to a large bowl (very large), except the Almond Flour. Mix very well. With a fork if you must, but the best is with your hands. I'm not going to lie, I am totally grossed out by this, so again I state, this is my husband's specialty! You have to break up the bones as you go, or you will bite into them, so spend some time mixing this stuff until it almost looks like pate. Then mix in the Almond Flour and continue mixing until it is fully combined. Heat fat over medium-med/hi heat. Form patties and add to hot grease. Cook each side 3-5 minutes and flip as necessary. I know a burger you are only supposed to flip once, but this doesn't get drier if you keep flipping it. Just keep cooking until they are browned on the outside and warm all the way through. As the eggs cook, the patty will become nice and firm. Mix all of the ingredients together. Allow to sit for 10 minutes or so. Serve. Here's 1/2 the recipe if you don't have an army to feed like I do. *Old Bay Seasoning contains a lot of salt. 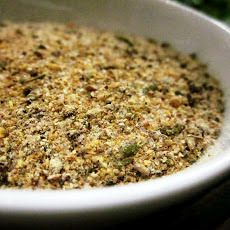 If you are using a seafood seasoning that is salt-free, make sure to add sea salt to your mixture as well. Today, these made the perfect Sunday lunch fare and we had a few leftover for later this week. I served them with a Grain-free Squash casserole (which needs some perfecting) and Cinnamon Buttered Apples. Now I'm ready for a Sunday nap! I wanted to keep the garlic and jalapeno really fine so not to over power the kraut, so I used the shredding attachment on my food processor. You could also just chop them really finely, just make sure not to touch your eyes until you are done and wash your hands. My family is so fussy about spicy food, much to my avail. I didn't want anyone biting into either and complaining that it was "too hot". If your family can handle spicy stuff, by all means put some more jalapenos in there! Add all of the ingredients to a large container and use a potato masher or meat tenderizer to start to break down the cabbage. If it isn't breaking down you can let it sit for 30 minutes and then start to work it. I think mine would have done better had I done this. My head of cabbage was very firm and I shredded it into bigger pieces. 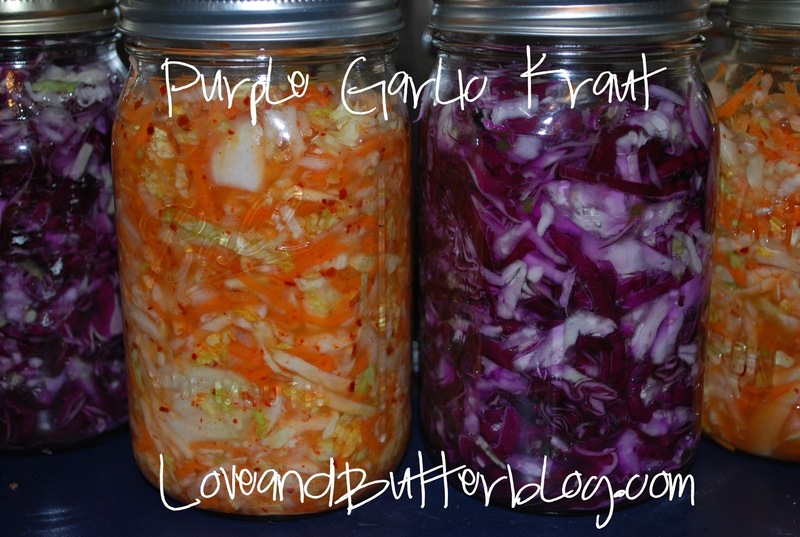 When I make my Simple Kraut, I shred the cabbage finer and it breaks down quite quickly. But I read on Wild Fermentation, that it is okay to walk away for a little bit and let the salt begin to soften the cabbage. 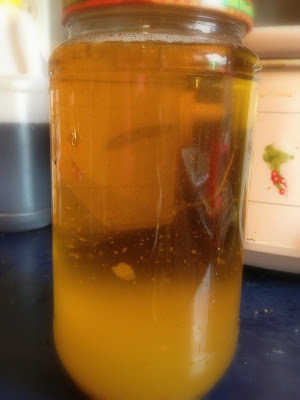 When it has produced some liquid, you can add it to your jars. Make sure to push the cabbage down under the liquid. You can also add a small amount of filtered water to the top to cover it. 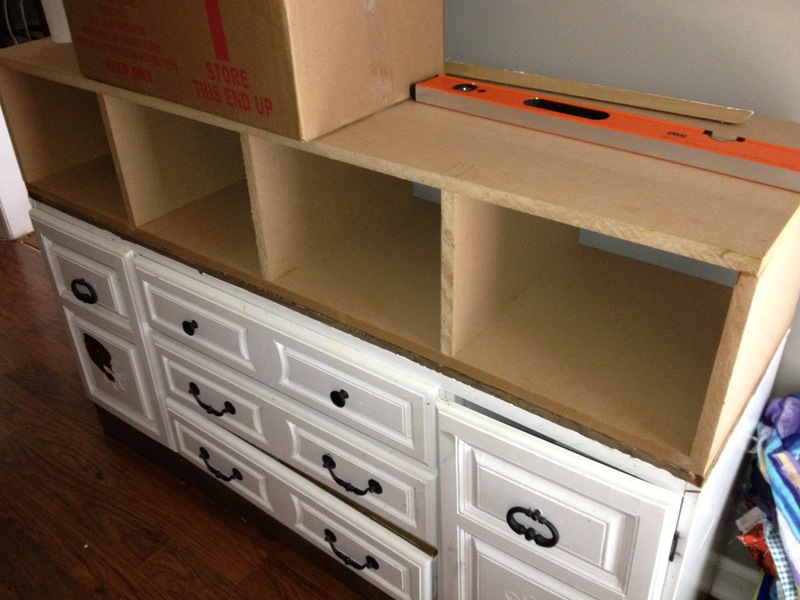 Put the lid on tight and place in a warm part of your kitchen. And ferment for 3 days. This winter, I've been using my Slow Cooker to keep my ferments happy and going. Plus, I always have broth on hand. I also made a batch of Kimchi to go along with this. I love the way the Purple and Orange look next to each other. We loved this kraut! More than I expected. It wasn't very hot, like a homemade mild/medium salsa. We ate it on fajitas that I made grain-free tortillas for. The tortillas were a toss up with my kids, because we are so new to this GAPS/grain-free lifestyle. But the Kraut was a hit all around. The color is amazing and red cabbage is much milder than green cabbage in my opinion, you don't get that peppery bite. This is definitely one of the brightest meals we've ever had! We also ate the kraut on some Apple Sausages this week and loved it straight out of the jar! Well, happy fermenting to you. Hope you give this one a try, you will not be disappointed!